Having a safe and comfortable place to live is a basic human desire, but it is nonetheless very common for people to act in a way that causes them to be evicted from their homes. Eviction is the legal process a landlord can take to force a tenant to vacate the property that he or she is renting. Failure to pay rent and failure to adhere to the lease are the two most common reasons that evictions occur. 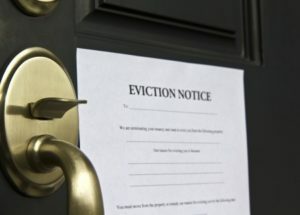 The process servers who have the responsibility of serving eviction notices are always prepared for conflict, and as these situations prove, serving eviction documents can be a dangerous job. Until recently, 31-year-old Brittany Simpson lived with her parents in their waterfront mansion in Charleston, South Carolina. On March 31, Robert Simpson and his wife began a formal eviction process in Charleston County Circuit Court, though the reason for the eviction is unclear. A judge approved the eviction on Thursday, May 4, and Simpson was served with a 24-hour notice to vacate. However, Simpson has been charged with murdering her father after receiving the notice. The details are still forthcoming, but it is clear that this tragedy is a direct result of the eviction proceedings. Coleman also placed others in danger when deputies arrived at her apartment to enforce her eviction. Despite receiving many warnings, Coleman ignored her eviction notices and refused to leave her apartment upon a court order. Even after being placed under arrest, Coleman fought back and ran away from the police, who tried to block her way by tasing her. Coleman responded by grabbing a nearby toddler and using the child as a shield from the taser. The police finally apprehended her, and Coleman is now charged with remaining after forbidden, resisting an officer by force, and disturbing the peace. If you are a landlord with eviction problems of your own, turn to Accurate Serve in Tampa, Florida to serve all eviction notices efficiently and promptly. Call (813) 644-9368 to learn more about the services offered by Accurate Serve’s accredited process servers.